Want to get your hands on delicious, peak of season, local produce while living the life of a Bostonian city-slicker? Now is your chance to join a Community Supported Agriculture (CSA) program with one of the many farms just outside Boston. CSAs allow subscribers, or farm “shareholders,” to create their own true farm-to-table experience while investing in the local agriculture system. Shareholders receive a box of produce each week, to be picked up at a convenient delivery location in their neighborhood. 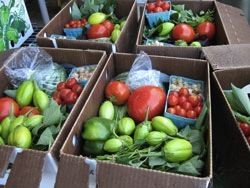 Boxes typically come in two sizes—a small share for 2 produce munchers or a large share for 4 or 5, with shares becoming heavier as we come into New England agriculture season. Shareholders receive whatever is freshest, and boxes typically contain a mix of fruits, vegetables and herbs. Alternatively you can get a meat CSA which contains fresh local meat, fish and poultry. Becoming a CSA shareholder gives you ultimate bragging rights to let others know that you can handle any seasonal ingredient that comes your way, from kohlrabi to prickly pear. And farmers make sure to give shareholders plenty of guidance through sending recipes for using your new produce, tips for storage, and a friendly farm newsletter with each box. The following farms have unique social missions, stand out for produce quality, and offer CSAs that will liven up your kitchen and guarantee you get your daily micronutrients. Tufts’ New Entry Sustainable Farming Project puts on the World Peas CSA, an innovative program that combines the produce of several small farmers. World Peas CSA provides CSA shareholders with greater crop diversity (i.e. stone fruits, sweet corn and vegetables) while supporting farms that wouldn’t be able to manage a CSA on their own due to limited resources or because they are just starting out. Pick up locations are central to Tufts students and are on Tuesday, Wednesday or Thursday in Somerville, Medford, Cambridge, Chinatown, Jamaica Plain and as far out as Concord. The 20 summer share distributions begin the second week of June and continue through the third week of October. Fall/academic shares run for 8 weeks in September and October. Prices are $795 for large shares that feed 4 or 5 individuals, $525 for small shares feeding 2 individuals, and $225 for fall/academic shares. ReVision Urban Farm is located in Dorchester, MA and grew out of a program that provides homeless families with fresh produce, job skills and quality time in the garden. ReVision offers 18 weekly boxes with as many as ten different vegetables and herbs. Box sizes vary from a half bushel to a full bushel each week (1 bushel = 48 pounds of apples), depending on harvest size. Members receive a large share for $550 ($200 for households of low income living in Dorchester and Mattapan). Distributions are from June 12th through October 9th on Wednesdays from 5-8pm. Pick up locations are in Cambridge, Somerville, Dorchester, Roxbury, and Jamaica Plain. 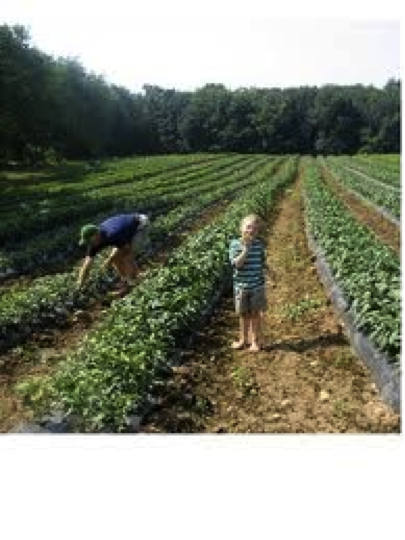 The Food Project works with teenagers and volunteers from the Boston area to farm 40 acres in eastern Massachusetts. The program engages young people in personal and social change through sustainable agriculture, and either sells food produced to Boston residents or donates it to local hunger relief organizations. A box share can feed 1-2 vegetarian adults or 2-3 omnivorous individuals, and contains up to 18 pounds of produce depending on the time of season. Distributions begin the second week in June and continue through the end of October, with 21 distributions. Pick-up sites are on Tuesdays from 4-8pm in Arlington, Brookline, Cambridge, Lincoln, Roxbury and Somerville, and on Thursdays from 3-7pm in Jamaica Plain, Lincoln and Wellesley. Shares cost $500 and can be paid at once or in monthly installments. Stillman’s Farm offers flexible sizing and pricing. Small share boxes for the season are $350 and large are $500. Summer shares run 17-18 weeks and begin the third week of June and continue into October. Stillman’s also offers a winter CSA with three pick-ups in November and December and a meat CSA (information below). Stillman’s also gives members $20 Stillmans bucks to be used at their market stands or at the pickup locations, invitations to the farm for pick your own, and discounted extra produce for freezing, canning, etc., and gleaning. Just to give you a glimpse of what Stillman’s might offer in July for a small box: ½ pint blueberries, one half dozen corn, 1 head lettuce, assorted squash, 1 pound tomatoes, 1 pound peas or beans, two cucumbers, a bunch of kale, and anything else to round things out. A large share box would be similar but containing greater quantity and larger variety of items per week. Stillman’s at the Turkey Farm Meat CSA shares are available year round in quarter (5 lbs/month), half (10 lbs/month) and full sizes (20 lbs/month) for six or twelve month periods. 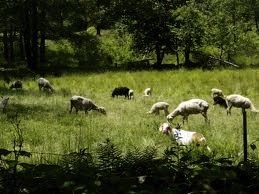 The small, artisan family farm produces conscientiously raised, grass-fed, pastured, and chemical free meats and poultry. Prices range from $9.16 per pound to $8.25 per pound depending on the share size and membership length. Shares consist of a combination of beef, pork, lamb and chicken. Pick up locations are on the weekends in Cambridge, Somerville, Quincy, Lunenburg, Brookline and Jamaica Plain. Based in Gloucester, MA, America’s oldest seaport, Cape Ann Fresh Catch offers weekly or bi-weekly Gulf of Maine groundfish (a white-flaky fish) shares that consist of 4 to 6 pounds of whole fish for $22 per week or 2 pounds of filleted fish for $26 per week. Shares can be modified for Kosher households or Scrombic intolerance. Pick up sites are throughout the area, from Newburyport to Canton and memberships run 12 weeks in spring, 12 weeks in summer, 10 weeks in fall and 8 weeks in winter. The farms listed above are not certified organic; however, all of them use sustainable farming methods and grow food in a way that preserves and enhances the environment, provides economic opportunity and good health for individuals and communities, and connects people to the land around them. The farms do not use chemical fertilizers or pesticides on their crops. Can’t afford the price of local, high quality produce? Most of the farms listed offer volunteer programs where individuals come weekly to offer help boxing produce in return for CSA shares and produce extras. Amy Elvidge is a first year AFE student. She just signed up for a CSA in California where she will be serving her Friedman internship with WIC’s Farmers’ Market Nutrition Program.